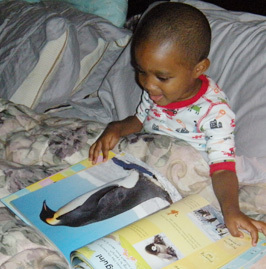 If you have read to your child since he was a baby you will notice that he is starting to show a real interest in books for himself. 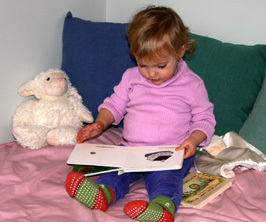 He will sit and look at books and pretend to read them, reciting the story to himself and commenting on the pictures. Place a small bookcase of his own in his room or in the lounge where he can keep a few of his favourite books and you can swap in new ones each week. The books should be displayed so he can see the front of the book not the spine. This helps him to easily find what he wants and the pictures on the front call to him. Books should be simple stories about real life and the things he finds around him when he goes out to the park or the shops with you. They should be about the kind of people he comes across in his life, like a visit to the dentist or the doctor. Avoid fantasy at this age as he needs to understand real life before he can understand that men don't really fly and goblins don't really exist. Fantasy is only confusing to his mind at this stage. Stories should also have good moral undertones in them. Try not to offer books where children behave badly. These are meant to be funny but when children are this age they only offer them models of bad behaviour to copy. 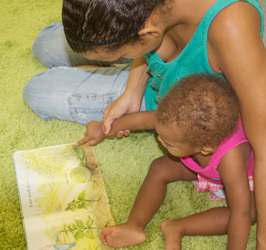 Avoid books that may be frightening to a child of this age such as stories about things that might be hiding in the dark. As long as we don't represent the dark as frightening children will not develop a fear of it. Find books with songs that you can sing together and look at the pictures and repetitive rhymes so your child can start to predict the words. Find simple songs that have a few actions that you and your child can do together. Finger plays where you can use your fingers to make the actions can be very appealing to the child at this stage who is just learning to use his hands. Show him how to turn the pages of a book by breaking down the movements you make and always handle books with care and respect yourself. Sing every day with your child using a small repertoire of songs, rhymes and action songs that you can repeat often with your child so he starts to join in with you. Continue to have a place and time to read, as a quiet interlude in the day and before bed at night. 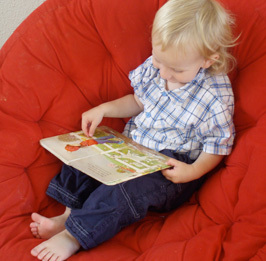 Be prepared with books if you are going to be in a confined place like the car or bus or the waiting room at the doctors, so you have a productive way of engaging and occupying your child.